I LOVE my dehydrator! I have an Excalibur 9-tray dehydrator. I bought it directly from the manufacturer for about $279 or so. I would also suggest buying a few tray liners along with your dehydrator. I have 7. I bought the Excalibur brand. You will need them if you make beef jerky or fruit leathers. I also use them for kale chips and bananas because it makes clean up easier. I spent the money for this one because I knew I’d be using it a lot and I have four kids. You can get away with a smaller cheaper one that you can find in stores for about $40. They are circular in shape. They just won’t hold as much. You can also dehydrate fruit in the oven. I’ll explain how below. Apples and pears are probably the most popular fruit to dehydrate. You can make dried apples or dried pears the exact same way. Pears are Feingold stage one and apples are stage two. I make both because I like the apples. I give my kids the pears but they think they are apples. 🙂 I just put theirs in a separate jar or bag with their names on them, then I hide mine. These don’t last long though! 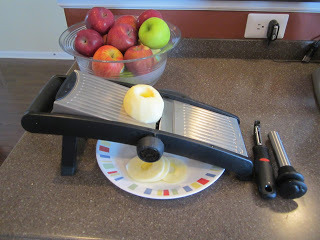 Here are a few things that will be helpful if you are drying apples or pears. A peeler – although some people leave the skin on. I like them peeled, as do most people. I have another peeler that suctions to the counter top and peels the apple while you crank it in a circle. They also have ones that will core and slice it at the same time. I think I got a cheap one because it never worked very well. The apple kept falling off and it seemed to peel too much of the apple. I went back to a manual peeler though my kids loved the other one. An apple corer (optional but really helpful). If you don’t have an apple corer, you can slice the apple with the core still in tact. Then use a small cookie cutter to cut out the center, or use a sharp knife to do so. We’ve made some cool star and heart shape centers using cookie cutters before I bought a corer. A mandoline/slicer. I love my mandoline. I got an OXO one online for about $60 but you can get them cheaper than that. I originally bought it to make fries.You can set the thickness. I use 1/4 inch for my apples, and pretty much everything I dehydrate. If you don’t have a mandolin, you can just cut the apples with a sharp knife. I make circles but some people do half circles. The mandoline is nice because all the slices come out the exact same thickness. When they are different thicknesses, they can end up drying at different times. The mandoline makes slicing easier and quicker too. So, first I wash and peel my apples. It helps if you have a helper for this. Then core the apples and slice. It doesn’t really matter what kind of apples you use but I like Fuji apples the best and we always try to get organic. 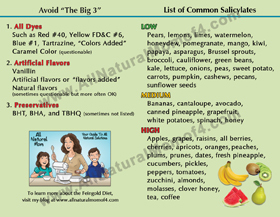 Green Granny Smith apples have a lower salicylate content but are more sour. If you sprinkle them with cinnamon sugar, it helps make them sweeter though. I usually make a mixture of both kinds of apples. As well, if you peel apples, it lowers the salycilate content too. Some less sensitive kids do OK with peeled apples. 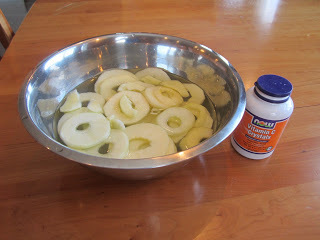 Place the sliced apples in a bowl filled with water and about 1 TB of vitamin C crystals/ascorbic acid. If you don’t have vitamin C crystals, you can crush up a TB worth of vitamin C from tablets or capsules. The vitamin C helps prevent mold from forming and it prevents oxidation so that the apples or other fruit don’t brown. I dip almost everything I dehydrate in this. For apples, I also add the juice of one lemon. You don’t have to do both but I do. The lemon juice does the same thing. Using vitamin C crystals also adds vitamin C to your dried fruit. Leave the apples in the water for anywhere from 2 to 10 minutes. I let them soak while I’m peeling and slicing the other apples. After they are done soaking, lay them on a tray or plate that has been lined with paper towels or a clean dish towel. Blot the top of them with paper towels or a clean towel to absorb excess water. Sprinkle with cinnamon sugar (optional). You can also use just cinnamon if you want to avoid sugar. 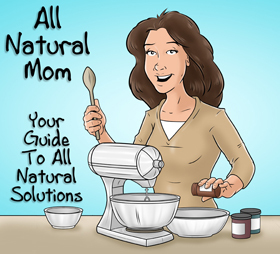 You can make your own cinnamon sugar by combining 1/2 cup of sugar (we use organic from Costco) and 1 TB of cinnamon. I bought a jar of cinnamon sugar once and when it ran out, I made my own and then I stored it in this jar. Move the apples to your dehydrating trays, making sure the apples do not touch. You want to leave enough room for the air to circulate around them. I dehydrate everything I make at about 115 degrees so that they remain raw and maintain all of their live enzymes. When you do this, the fruit keeps the same amount of vitamins and minerals as if you were eating it fresh. I do start the dehydrator out at 135 degrees though for the first half hour. During the first half hour or so, the temperature is lowered by the moisture in the fruit. You just have to remember to lower it back down to 115. Starting it out at 135 will help reduce the time it takes to dehydrate without compromising the live enzymes. 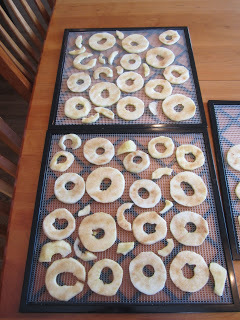 About half way through the drying time, you can flip the apples over if you want. You can also take the trays out and turn them around. This will speed up the drying time. In a dehydrator, apples can take anywhere from 8 to 12 hours depending on the climate where you live and how dry you like them. I usually set mine for 10 hours and then check them periodically. You want them pliable but not too moist. If they are too moist, you will know because after they are dried and stored, they will stick together and you will feel moisture on them. After you’ve dehydrated a few times, you’ll get used to knowing exactly when the fruit is done. 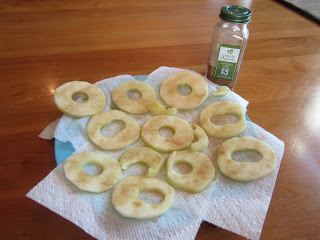 If you do not have a dehydrator, you can dry apples in your oven. You just won’t be able to make as many apples because you will be limited to one baking tray at a time. I’ve never dehydrated in the oven. There are various temps and times out there. You can watch some YouTube videos on it but usually I’ve heard anywhere from around 135 to 250 degrees for drying in your oven. 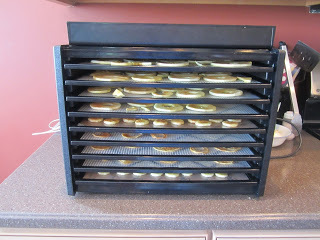 I think I would put the apples on a cooling rack first then on a tray so that some air gets underneath the apples too. Flip them over about half way through drying. Some ovens cannot be set this low. I’ve heard of some people who crack their oven open a little bit to lower the temperature. I wouldn’t want to do that in the summer though. At 250 degrees, your apple chips might be ready in about 1.5 to 2 hours. You kind of just have to watch them. At a lower temp, it will take longer. I store our apple chips in a glass mason jar or a large zip lock bag. Store in a cool dry place. I also put the date on them if they are in a bag just in case they get lost in our pantry. They should last for up to 12 months if they are fully dried. You can use dried apples in your oatmeal, yogurt, smoothies, trail mix, or straight off your finger! My kids love these! Dehydrated fruit makes a great snack for school or to take along on vacations. It also makes great gifts. You can put a stack of dried apples in a mason jar with a cinnamon stick in the middle. Tie a pretty bow around the lid, and voila! 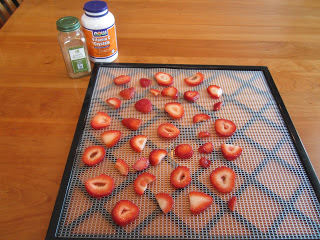 If you have a big dehydrator and have room for more, you can add sliced strawberries and bananas on to your trays as well. Yum! 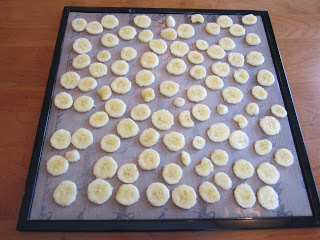 When I dehydrate, I usually will do the pears first, then the apples, then strawberries, and bananas last. I use the mandoline to slice these as well. I use the same bowl of water for all of them, sometimes adding more Vitamin C to the water. For strawberries, sometimes I sprinkle sugar or cinnamon sugar on them so they aren’t as sour. I like them either way but my kids like them sweeter. Make sure your strawberries or bananas aren’t over ripe. You can add dried strawberries to oatmeal, yogurt, or cereal. For bananas, you can also add some honey to the bowl of water. I dump out some of the water so that the bananas are just covered. You can use anywhere from 1/8 to 1/2 cup of honey. I use about 1/4 cup. 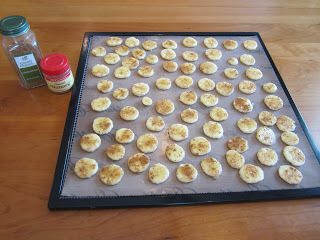 You can leave the bananas plain or sprinkle a cinnamon/nutmeg mixture on them. Combine 1 TB of cinnamon and 1/4 tsp of nutmeg. Bananas get stuck to the trays a little bit so sometimes I use a tray liner for bananas. This will increase the drying time a little bit and you definitely have to flip them over half way through to get both sides dried completely. Using a tray liner makes cleaning the trays a lot easier. And here’s my fully loaded dehydrator with apples, pears, bananas, and strawberries. Smells delicious in here! 🙂 I’ll post a picture of the final product in about 8 hours! They’re still drying! I’ve also dehydrated pineapple. I get a cored one from Whole Foods then just slice it up and put it on a tray. Sometimes I don’t even dip it in the vitamin C water. Pineapples can go without. Pineapples contain bromelain which is a digestive enzyme. 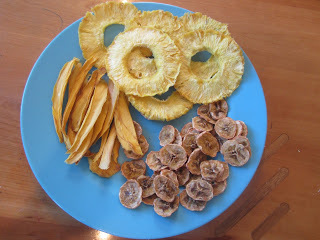 I’ve thought of giving my kids a slice of dried pineapple before eating to help with digestion! I’ve read that pineapple also helps with headaches. Although if you have issues with mold or yeast overgrowth, it could contribute to headaches. Dried pineapple is my favorite! Very sweet. We’ve also done kiwi (little sour but I like it with strawberries and apples), and we’ve done mango. My daughter likes mango. I used to make long pieces for my daughter when she was teething and she would gnaw on it. She’d also do that with apple slices. She went nuts for those. I just had to watch her and take it away when it started to fall apart. We did lemons once and my daughter put them in her water. We also did watermelon once. Watermelon contains so much water that most of the watermelon disintegrated but what was left tasted like cotton candy. I don’t recommend doing watermelon but it was fun to try once. So, if you are stage one, you will want to stick to bananas (medium sal), mango (in picture below), pears, kiwi, papaya, and maybe pineapple. Fresh pineapple has a higher sal content than canned pineapple so might have to test that one out. For veggies, we’ve done cucumbers, zucchini, and onions. My daughter loves onions and will eat them raw or dried like a snack. I did a whole tray of onions once and let me tell you my house stunk! I later read that when drying onions, you should put your dehydrator in your garage with the garage door open or out on your front porch or deck. Now I know why. My eyes were starting to burn. You have to dry them for several hours. But, my daughter liked them! I know my daughter would love dried tomatoes and I might try it this year if we get a lot of tomatoes in our garden. I’ve heard that you can dry the tomatoes then blend them into a powder and later add water and spices to make spaghetti sauce. Hmm. I’m skeptical but I’d love to try that one day. She just doesn’t do well with too many tomatoes so not sure if I’m brave enough to try them. Kale chips are also a favorite. 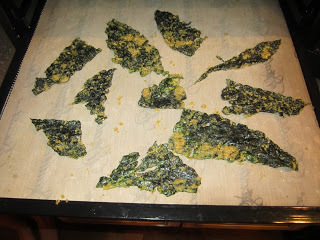 Here is our favorite Kale Chip Recipe. I’d like to try drying green beans one day too. We still need to try beef jerky and fruit leathers. You can make a stage one fruit leather with mango and banana. I just need to find a beef jerky recipe that doesn’t have soy in it. 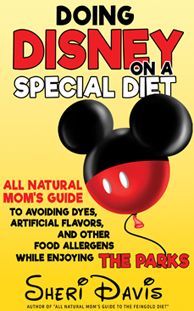 Most recipes include soy sauce or something else we can’t do. I’ve also heard of people drying yogurt to make a kind of taffy. Sounds good but we are dairy free and don’t like the dairy free yogurts. And that’s how we dehydrate! 🙂 If you dehydrate, please post your comments or suggestions! We’re still learning! 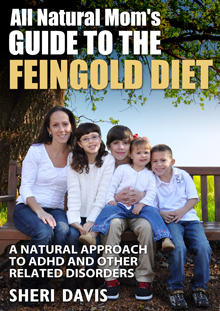 Posted in Feingold Diet and tagged Feingold and GFCF Recipes, Feingold Diet Info. 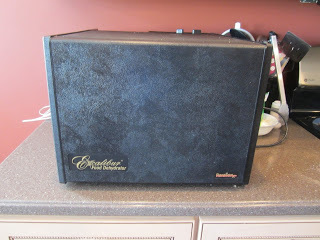 I just bought a dehydrator this summer but haven't used it…yet. However I have made fruit leather with pureed pears and canned pineapple…yum! Oh really? Cool. I wouldn't have thought to combine those two. Thanks!